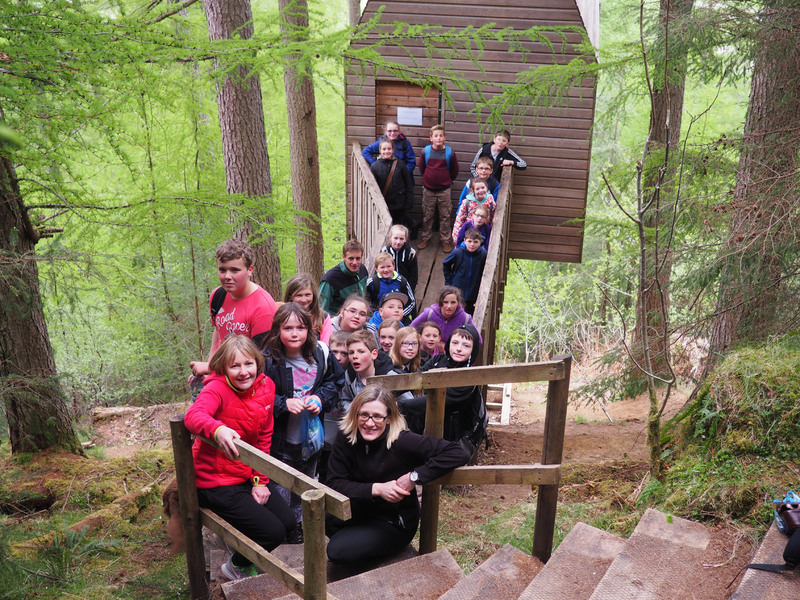 Young artists from three Lochaber schools have been making use of Outlandia, the treehouse and artists’ field station in Glen Nevis, as part of a programme of workshops for very young artists being run by Room 13 with support from the Highland Youth Arts Hub. In May 2016, three school groups were invited to Outlandia to participate in a series of projects with local artists Ali Berardelli and Jen Deschenes. Spean Bridge Primary School P6/7 class worked with the artists to illustrate an ancient Gaelic poem, Allt an t-Siùcair (The Sugar Burn) by Alasdair mac Mhaighstir Alasdair which explores the landscape around a burn in west Lochaber and used screen printing to create final images that have been on display in Outlandia. 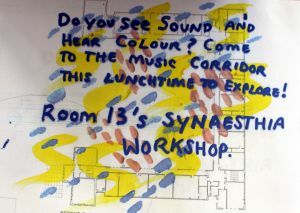 A sound work accompanied the images. The group travelled to Glen Nevis and walked to Outlandia to view their artwork and also to participate in a drawing and printing activity making mini sketchbooks from Outlandia. 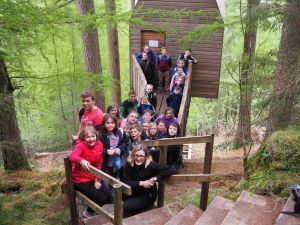 The groups were accompanied by Ruari Watt, Forestry Commission’s Communites, Recreation and Tourism Ranger who provided activities and information for all the pupils leading the pupils on adventures through the forest. 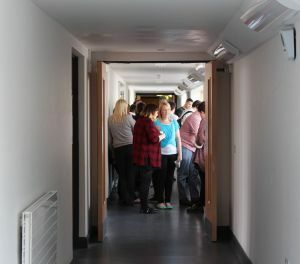 A group from the Learning Support Base at Lochaber High School worked with music therapist and teacher Clare Reynolds when they spent time at Outlandia. The group also worked with Ali Austin, the Nevis Property Manager with the John Muir Trust making journey sticks, a method of interpreting and illustrating the journey to Outlandia. Lundavra Primary 6/7 class visited the West Highland Museum as part of the Outlandia project to view the [wish] [miann] exhibition by Ali Berardelli and Jen Deschenes currently on show until later in the summer. The group then walked from Lundavra School across the Cow Hill to Outlandia where they participated in a drawing workshop and forest craft with Ruari Watt from Forestry Commission Scotland. 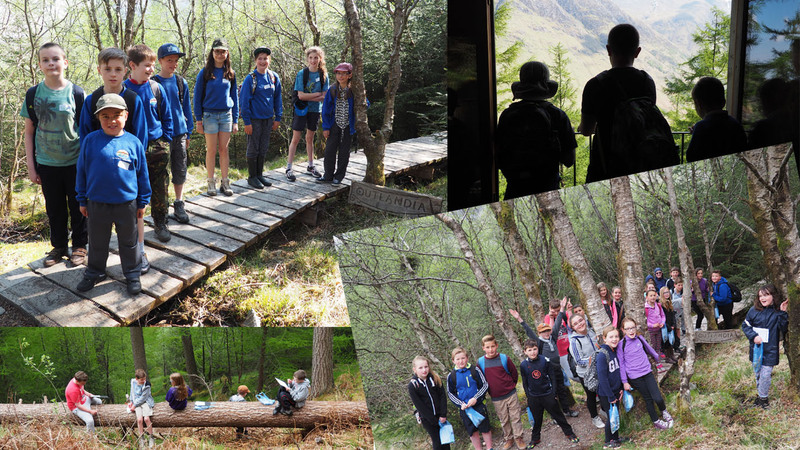 This project has been a great example of partnership working within the Lochaber community, from schools, Nevis Landscape Partnership, Forestry Commission Scotland, John Muir Trust, Room 13 International, the Highland Youth Arts Hub, and individual artists. The outcomes from the project and images will be available on the Outlandia blog and website. Ali Berardelli is a visual artist and project manager who lives locally in Fort William. Having been brought up in Lochaber, graduating from Glasgow School of Art in Illustration, and working within the Highland Council in arts development, Ali has been very involved in local community development work and has a strong interest in the visual arts. Ali has a young family and has worked with schools and community groups throughout the area helping to foster creativity in our community. Jen Deschenes is a textile based artist and designer who comes from the island of Whalsay, off the Shetland mainland. A strong interest in history has led her to design intricate embroidery work and explore printed mediums. Jen has made her home in Spean Bridge and has two children. She has exhibited her artwork widely to international acclaim. Clare Reynolds is a cellist, music therapist, and support for learning teacher who works with over 100 children from age 6 months to 18 years on a weekly basis in Fort William. She was raised in Lochaber and returned to the area with her family and has since provided extensive musical knowledge and developed unique opportunities for people to engage with music across the community. 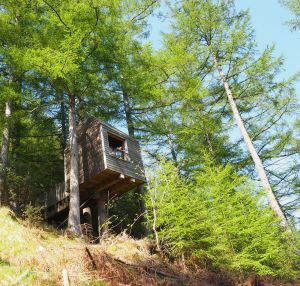 Outlandia is an off-grid, treehouse studio imagined by artists London Fieldworks and designed by Edinburgh based Malcolm Fraser Architects. Inspired by childhood dens, wildlife hides and bothies, by forest outlaws and Japanese poetry platforms, it is located in a copse of Norwegian Spruce and Larch in Glen Nevis on Forestry Commission land at the foot of Ben Nevis in the Scottish Highlands, approximately three miles from the town of Fort William. Outlandia is an artist-led project built as a multi-purpose platform for the use of diverse community groups as well as selected artists and is in line with The Scottish Forestry Strategy that aims to create opportunities for more people to enjoy trees, woods and forests in Scotland, and to help communities benefit from woods and forests.